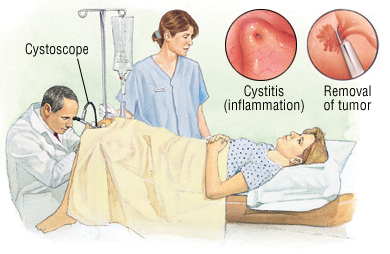 Cystoscopy is a procedure that allows doctors to look inside the bladder and the urethra, the tube that carries urine from the bladder. A cystoscope is a tubelike instrument with lenses, a camera and a light on one end and an eyepiece on the other. With a cystoscope, your doctor can examine the urethra and the lining of the bladder. If necessary, your doctor can pass surgical instruments through the cystoscope to perform specific procedures. In most cases, a simple cystoscopy lasts 5 to 10 minutes. Procedures that are more complex take longer.